11 A None No Power Seat 11 A is a standard Economy Class seat that has some extra legroom due to the position of the bulkhead, however, the proximity to the lavatory and galley might be bothersome. The tray table is in the armrest making the armrests immovable and slightly reducing seat width. There is no floor storage for this seat during takeoff and landing. 11 C None No Power Seat 11 C is a standard Economy Class seat that has some extra legroom due to the position of the bulkhead, however, the proximity to the lavatory and galleys might be bothersome. The tray table is in the armrest making the armrests immovable and slightly reducing seat width. There is no floor storage for this seat during takeoff and landing. 12 A None No Power Seat 12 A is an Economy Class seat that is designated by Aer Lingus as a Choice Seat, but is missing a window. 12 C None No Power Seat 12 C is an Economy Class seat that is designated by Aer Lingus as a Choice seat. The close proximity to the galley may be bothersome. There may also be limited legroom due to the presence of an entertainment equipment box under the seat in front. 12 D None No Power Seat 12 D is an Economy Class Bulkhead seat that has extra legroom, however, the proximity to the galley may be bothersome. The tray table is in the armrest, making the armrests immovable and slightly reducing seat width. There is no floor storage during takeoff and landing. There is a bassinet location here and passengers traveling with infants are often seated in this row. 12 E None No Power Seat 12 E is an Economy Class Bulkhead seat that has extra legroom, however, the proximity to the galley may be bothersome. The tray table is in the armrest, making the armrests immovable and slightly reducing seat width. There is no floor storage during takeoff and landing. 12 F None No Power Seat 12 F is an Economy Class Bulkhead seat that has extra legroom, however, the proximity to the galley may be bothersome. The tray table is in the armrest, making the armrests immovable and slightly reducing seat width. There is no floor storage during takeoff and landing. 12 G None No Power Seat 12 G is an Economy Class Bulkhead seat that has extra legroom, however, the proximity to the galley and lavatory may be bothersome. The tray table is in the armrest, making the armrests immovable and slightly reducing seat width. There is no floor storage for this seat during takeoff and landing. There is a bassinet location here and passengers traveling with infants are often seated in this row. 12 H None No Power Seat 12 H is an Economy Class Bulkhead seat that has been designated by Aer Lingus as a Choice seat. However this seat may have restricted legroom and the proximity to the galley and lavatory may be bothersome. The tray table is in the armrest, making the armrests immovable and slightly reducing seat width. There is no floor storage for this seat during takeoff and landing. 12 K None No Power Seat 12 K is an Economy Class Bulkhead seat that has been designated by Aer Lingus as a Choice seat but is missing a window. This seat may have restricted legroom and the proximity to the galley and lavatory may be bothersome. The tray table is in the armrest, making the armrests immovable and slightly reducing seat width. There is no floor storage for this seat during takeoff and landing. 13 A None No Power Seat 13 A is an Economy Class seat that Aer Lingus designates as a Choice seat. 13 C None No Power Seat 13 C is an Economy Class seat that Aer Lingus designates as a Choice seat. 13 H None No Power Seat 13 H is an Economy Class seat that Aer Lingus designates as a Choice seat. 13 K None No Power Seat 13 K is an Economy Class seat that Aer Lingus designates as a Choice seat. 14 A None No Power Seat 14 A is an Economy Class seat that Aer Lingus designates as a Choice seat. 14 C None No Power Seat 14 C is an Economy Class seat that Aer Lingus designates as a Choice seat. 14 D None No Power Seat 14 D is an Economy Class seat that Aer Lingus designates as a Choice seat. 14 E None No Power Seat 14 E is an Economy Class seat that Aer Lingus designates as a Choice seat. 14 F None No Power Seat 14 F is an Economy Class seat that Aer Lingus designates as a Choice seat. 14 G None No Power Seat 14 G is an Economy Class seat that Aer Lingus designates as a Choice seat. 14 H None No Power Seat 14 H is an Economy Class seat that Aer Lingus designates as a Choice seat. 14 K None No Power Seat 14 K is an Economy Class seat that Aer Lingus designates as a Choice seat. 15 A None No Power Seat 15 A is an Economy Class seat that Aer Lingus designates as a Choice seat. 15 C None No Power Seat 15 C is an Economy Class seat that Aer Lingus designates as a Choice seat. 15 D None No Power Seat 15 D is an Economy Class seat that Aer Lingus designates as a Choice seat. 15 E None No Power Seat 15 E is an Economy Class seat that Aer Lingus designates as a Choice seat. 15 F None No Power Seat 15 F is an Economy Class seat that Aer Lingus designates as a Choice seat. 15 G None No Power Seat 15 G is an Economy Class seat that Aer Lingus designates as a Choice seat. 15 H None No Power Seat 15 H is an Economy Class seat that Aer Lingus designates as a Choice seat. 15 K None No Power Seat 15 K is an Economy Class seat that Aer Lingus designates as a Choice seat. 16 A None No Power Seat 16 A is a standard Economy Class seat that has a misaligned window. 16 K None No Power Seat 16 K is a standard Economy Class seat that has a misaligned window. 2 A None No Power Seat 2 A is a standard Business Class Bulkhead seat. The close proximity to the galley and the position of the seat/bed to the aisle might be bothersome. There is no floor storage for this seat during takeoff and landing. 2 D None No Power Seat 2 D is a standard Business Class Bulkhead seat, however, the close proximity to the galley might be bothersome. There is no floor storage for this seat during takeoff and landing. 2 G None No Power Seat 2 G is a standard Business Class Bulkhead seat. The close proximity to the galley and the position of the seat/bed to the aisle might be bothersome. There is no floor storage for this seat during takeoff and landing. 2 H None No Power Seat 2 H is a standard Business Class Bulkhead seat. The close proximity to the galley and the position of the seat/bed to the aisle might be bothersome. There is no floor storage for this seat during takeoff and landing. 2 K None No Power Seat 2 K is a standard Business Class Bulkhead seat, however, the close proximity to the galley might be bothersome. There is no floor storage for this seat during takeoff and landing. 28 D None No Power Seat 28 D is an Economy Class seat that may have limited recline. The close proximity to the lavatories may be bothersome. 28 E None No Power Seat 28 E is an Economy Class seat that may have limited recline. The close proximity to the lavatories may be bothersome. 28 F None No Power Seat 28 F is an Economy Class seat that may have limited recline. The close proximity to the lavatories may be bothersome. 28 G None No Power Seat 28 G is an Economy Class seat that may have limited recline. The close proximity to the lavatories may be bothersome. 28 H None No Power Seat 28 H is an Economy Class seat, however, the close proximity to the lavatories may be bothersome. 29 A None No Power Seat 29 A is an Economy Class seat that may have limited recline. The close proximity to the lavatories may be bothersome. 29 C None No Power Seat 29 C is an Economy Class seat that may have limited recline. The close proximity to the lavatories may be bothersome. 29 H None No Power Seat 29 H is an Economy Class seat that may have limited recline. The close proximity to the lavatories may be bothersome. 29 K None No Power Seat 29 K is an Economy Class seat that may have limited recline. The close proximity to the lavatories may be bothersome. 3 A None No Power Seat 3 A is a standard Business Class seat. This seat has a nice wide console for storage and protection from aisle activity. 3 G None No Power Seat 3 G is a standard Business Class seat. This seat has a nice wide console for storage and protection from aisle activity. 3 K None No Power Seat 3 K is a standard Business Class seat that is described as one of the two best seats in the section due to consoles adjacent to the aisle and the window. The seat offers excellent privacy. 30 A None No Power Seat 30 A is an Economy Class Exit Row seat that has extra legroom. However, the Exit door may protrude into some of this space. The tray table is in the armrest, making the armrests immovable and slightly reducing seat width. There is no floor storage for this seat during takeoff and landing. 30 C None No Power Seat 30 C is an Economy Class Exit Row seat that has extra legroom. The tray table is in the armrest, making the armrests immovable and slightly reducing seat width. There is no floor storage for this seat during takeoff and landing. 30 D None No Power Seat 30 D is an Economy Class Exit Row seat that has extra legroom due to the legroom of the bulkhead. The tray table is in the armrest, making the armrests immovable and slightly reducing seat width. There is no floor storage during takeoff and landing. There is a bassinet location here and passengers traveling with infants are often seated in this row. 30 E None No Power Seat 30 E is an Economy Class Exit Row seat that has extra legroom due to the location of the bulkhead. The tray table is in the armrest, making the armrests immovable and slightly reducing seat width. There is no floor storage for this seat during takeoff and landing. 30 F None No Power Seat 30 F is an Economy Class Exit Row seat that has extra legroom due to the location of the bulkhead. The tray table is in the armrest, making the armrests immovable and slightly reducing seat width. There is no floor storage for this seat during takeoff and landing. 30 G None No Power Seat 30 G is an Economy Class Exit Row seat that has extra legroom due to the legroom of the bulkhead. The tray table is in the armrest, making the armrests immovable and slightly reducing seat width. There is no floor storage during takeoff and landing. There is a bassinet location here and passengers traveling with infants are often seated in this row. 30 H None No Power Seat 30 H is an Economy Class Exit Row seat that has extra legroom. The tray table is in the armrest, making the armrests immovable and slightly reducing seat width. There is no floor storage for this seat during takeoff and landing. 30 K None No Power Seat 30 K is an Economy Class Exit Row seat that has extra legroom. However, the Exit door may protrude into some of this space. The tray table is in the armrest, making the armrests immovable and slightly reducing seat width. There is no floor storage for this seat during takeoff and landing. 39 D None No Power Seat 39 D is an Economy Class seat. However, this seat juts into the aisle and may often be bumped by service carts or others passing by due to the awkward configuration transition from 4 to 3 seats. 39 G None No Power Seat 39 G is an Economy Class seat. However, this seat juts into the aisle and may often be bumped by service carts or others passing by due to the awkward configuration transition from 4 to 3 seats. 4 A None No Power Seat 4 A is a standard Business Class seat. The position of the seat/bed to the aisle might be bothersome. 4 D None No Power Seat 4 D is a standard Business Class seat. This seat has a nice wide console for storage and protection from aisle activity. 4 G None No Power Seat 4 G is a standard Business Class seat. The seat/bed to the aisle might be bothersome. 4 H None No Power Seat 4 H is a standard Business Class seat. The position of the seat/bed to the aisle might be bothersome. 40 A None No Power Seat 40 A is an Economy Class seat, however, the seats in this area feel cramped and narrower due to the curvature of the plane. 40 C None No Power Seat 40 C is an Economy Class seat, however, the seats in this area feel cramped and narrower due to the curvature of the plane. 40 D None No Power Seat 40 D is an Economy Class seat. However, this seat may have restricted legroom due to the misaligned seats and the awkward configuration transition from 4 to 3 seats. While you have some extra storage space, you'll have to maneuver your legs around the extra seat anchors. The tray table is in the armrest, making the armrests immovable and slightly reducing seat width. 40 E None No Power Seat 40 E is an Economy Class seat. However, this seat may have restricted legroom due to the misaligned seats and the awkward configuration transition from 4 to 3 seats. While you have some extra storage space, you'll have to maneuver your legs around the extra seat anchors. The tray table is in the armrest, making the armrests immovable and slightly reducing seat width. 40 G None No Power Seat 40 G is an Economy Class seat. However, this seat may have restricted legroom due to the misaligned seats and the awkward configuration transition from 4 to 3 seats. While you have some extra storage space, you'll have to maneuver your legs around the extra seat anchors. The tray table is in the armrest, making the armrests immovable and slightly reducing seat width. 40 H None No Power Seat 40 H is an Economy Class seat, however, the seats in this area feel cramped and narrower due to the curvature of the plane. 40 K None No Power Seat 40 K is an Economy Class seat, however, the seats in this area feel cramped and narrower due to the curvature of the plane. 41 A None No Power Seat 41 A is an Economy Class seat, however, the seats in this area feel cramped and narrower due to the curvature of the plane. 41 C None No Power Seat 41 C is an Economy Class seat, however, the seats in this area feel cramped and narrower due to the curvature of the plane. 41 H None No Power Seat 41 H is an Economy Class seat, however, the seats in this area feel cramped and narrower due to the curvature of the plane. 41 K None No Power Seat 41 K is an Economy Class seat, however, the seats in this area feel cramped and narrower due to the curvature of the plane. 42 A None No Power Seat 42 A is an Economy Class seat, however, the seats in this area feel cramped and narrower due to the curvature of the plane. 42 C None No Power Seat 42 C is an Economy Class seat, however, the seats in this area feel cramped and narrower due to the curvature of the plane. 42 G None No Power Seat 42 G is an Economy Class seat, however, the close proximity to the lavatory may be bothersome. 42 H None No Power Seat 42 H is an Economy Class seat located in the last row of the plane and may have limited recline. The close proximity to the lavatory may be bothersome. 42 K None No Power Seat 42 K is an Economy Class seat located in the last row of the plane and may have limited recline. The close proximity to the lavatory may be bothersome. 43 A None No Power Seat 43 A is an Economy Class seat located in the last row of the plane and may have limited recline. 43 C None No Power Seat 43 C is an Economy Class seat located in the last row of the plane and may have limited recline. 43 D None No Power Seat 43 D is an Economy Class seat located in the last row of the plane and may have limited recline. 43 E None No Power Seat 43 E is an Economy Class seat located in the last row of the plane and may have limited recline. 43 G None No Power Seat 43 G is an Economy Class seat located in the last row of the plane and may have limited recline. The close proximity to the lavatory may be bothersome. 5 A None No Power Seat 5 A is a standard Business Class seat. This seat has a nice wide console for storage and protection from aisle activity. 5 D None No Power Seat 5 D is a standard Business Class seat. The position of seat/bed to the aisle might be bothersome. 5 G None No Power Seat 5 G is a standard Business Class seat. This seat has a nice wide console for storage and protection from aisle activity. 5 K None No Power Seat 5 K is a standard Business Class seat that is described as one of the two best seats in the section due to consoles adjacent to the aisle and the window. The seat offers excellent privacy. 6 A None No Power Seat 6 A is a standard Business Class seat. The position of the seat/bed to the aisle and the proximity to the galley might be bothersome. 6 D None No Power Seat 6 D is a standard Business Class seat. This seat has a nice wide console for storage and protection from aisle activity. The proximity to the galley might be bothersome. 6 G None No Power Seat 6 G is a standard Business Class seat, however, the proximity to the lavatory and galley might be bothersome. 6 H None No Power Seat 6 H is a standard Business Class seat. The position of the seat/bed to the aisle and the proximity to the lavatory and galley might be bothersome. 6 K None No Power Seat 6 K is a standard Business Class seat however, the proximity to the lavatory and galley might be bothersome. 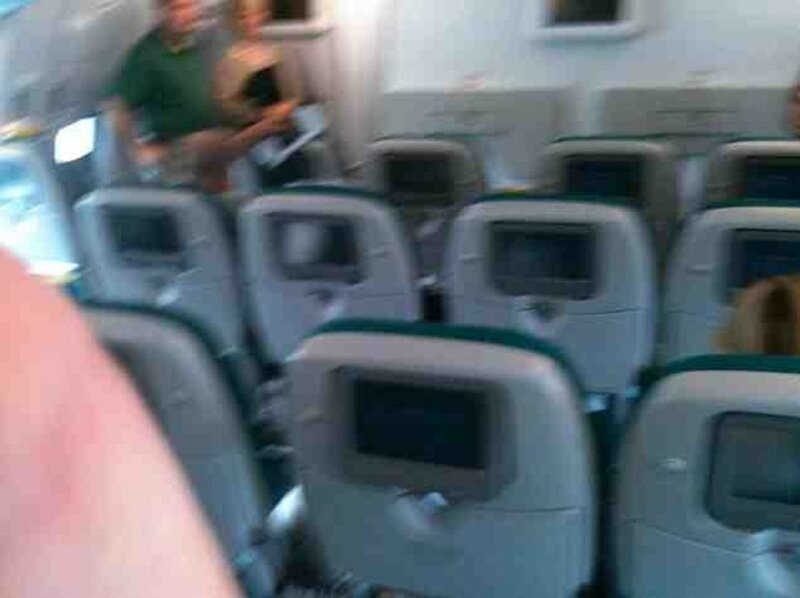 Aer Lingus' A330-200 features AVOD (Audio Video on Demand) in both classes. Passengers seated in Business Class may create their own personal playlists, using the thousands of MP3s available. 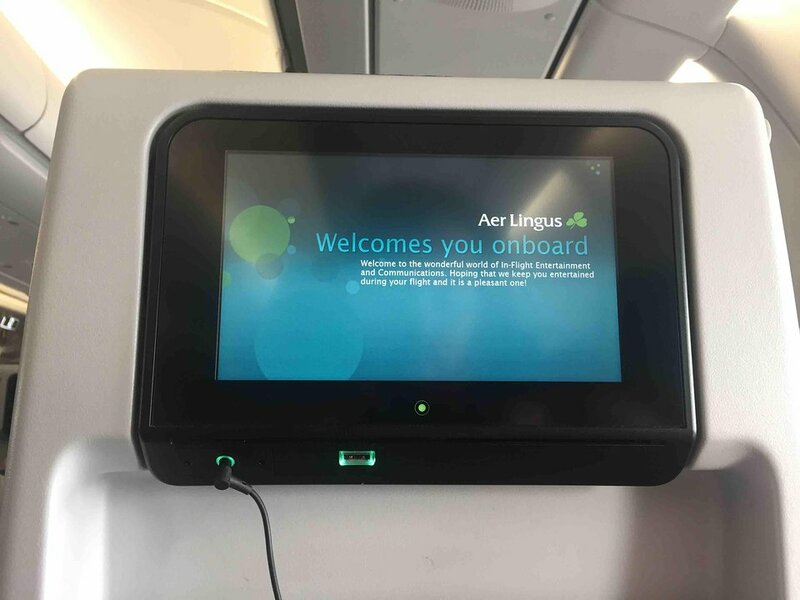 Aer Lingus' A330-200 features AVOD (Audio Video on Demand) in both classes, which allows passengers to watch a variety of movies, television programs and music videos. Headphones are provided complimentary on all long-haul flights. This aircraft is equipped with Ireland/UK compatible 240V AC power outlets at every Business seat and between every two Economy seats. Each seat has a USB power port. Wi-Fi is available on all A330 aircraft on all transatlantic routes. Click here to learn more. On long-haul flights, passengers receive complimentary meals including a starter, choice of main course, dessert, and non alcoholic drinks. There is a charge for alcoholic beverages. Snacks and breakfast are also served on applicable flights. This version of A330-200 operates in a two-class configuration of 23 Business Class and 248 Economy Class seats. This window seat was okay. I could not reach my items below the seat in front of me without asking the person next to me to lift the tray table. The seats in front of me when reclined did not push my tray table toward me. The window was slightly forward of the seat and the view was mostly the back of the wing. The entertainment system was touchscreen and had a good selection of music, games, movies and TV. European plug ear buds are provided at no cost. I could feel the leg of the person sitting next to me. This seat cushions provided no comfort and it felt like sitting on a cement bench. The arm rests between the seats on this plane do not lift up completely between the seats, making it impossible to lie down across the empty seats next to you. I'm 5'7" and my knees were touching the seat in front of me. These were the worsts seats I have every had and we actually paid $70.00 per seat for extra legroom! which is absolutely not true. There was no extra legroom, the seats were the smallest I've encountered AND the arm rest does not go up which made uncomfortable seats even more so. I contacted the airlines countless times to get a refund for the extra legroom fees we paid and they w refused to give me one. I finally had to file a complaint to US DOT and finally got a refund. Do not fly Aer Lingus if you live in a larger body and do not pay extra for extra legroom. My wife and I sat in 11H&K for a flight from IAD to DUB. It is definitely not worth it to pay extra for these seats. In addition to the seat being more narrow, there is less legroom here than a regular coach seat. In other words it is very cramped. We actually moved back to coach on our return trip even though we had reserved the same bulkhead seats reserved for our return trip. The coach seats were slightly more comfortable. In actuality, the entire plane felt cramped (unless I guess you were in business class). It is clear that they were trying to cram more seats onto this plane. All seats were narrower than other airlines we've flown. The aisles were narrower too. Really not comfortable for a transcontinental flight. Won't be flying AL again. coach seats on this flight are the very uncomfortable, we got very little sleep on the 10 hour flight, never again. 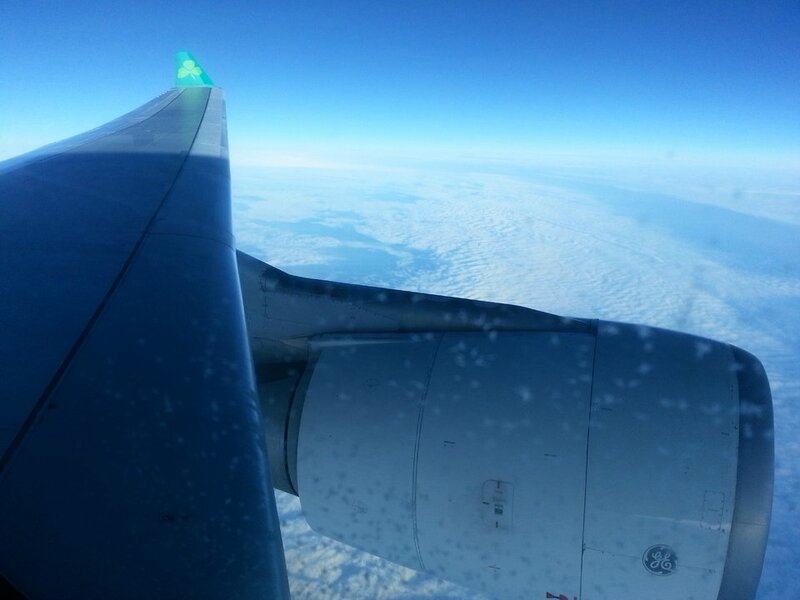 \we have flown Aer Lingus many times over past decades, they have gone way downhill, the breakfast burrito was a joke. This was a good experience for me. It was my first time with aerlingus and i was a little scared because of all the bad comments... but the staff was friendly the flight was smooth we had enough space but we are average to small people and last but not least the food was delicous. I hate the tea or coffe options for the food service but you can always ask for a cup of water instead and thats what I did. I cant say anything bad abkut that airline. I would definitely fly again with them. As a general rule the seat on some of the older Aer Lingus A300-200 series aircraft at very poor. The arms don't got up properly; meaning if you do have a free seat beside you you still can't stretch out. The front row seat are not only narrow due to tray table, but the passenger services unit extends into the space sticking into your hip in the process. How these guys are getting a 5 start rating is beyond me. In accordance with previous comments I can confirm that seat 3K is excellent. You have a great amount of privacy and no one to pass to access the aisle. This seat also has a terrific amount of flat surfaces on which you can place books, laptops, drinks etc. The level of adjustment to the seat is very good and in the lie flat bed position the seat is very comfortable. 3K and 5K are the best seats on the plane for solo travellers. The seat is spacious and is adjustable from fully upright to a recliner with leg rest to a fully flat bed. There is a storage locker and small table between the seat and aisle and a table with storage spaces between the seat and windows allowing you to have everything you could possibly need beside you for the flight and keep your bag in the overhead bin. As other comments have noted it is possible to unintentionally hit the controls with your leg and the bed is a bit hard but I slept just fine. Note that this seat has no laptop storage. Extra legroom seats at 11A and C but 11A is blocked by the door to the plane so does not actually provide any extra legroom. The extra legroom is frequently disturbed by people using the open space to wait for the toilet or just loiter and stretch their legs. Also positioned by the main door so all through boarding you have passengers stepping over you and dithering in front of you. Horrible seat. These are the best seats in coach. More leg room than in other bulkhead seating. No real smells/odors from the kitchen. Ample legroom, and little inconvenience from the "narrower" seats (I'm a little heavy and found them fine for me. If anything, there's "too much" leg room because there's nothing to anchor your feet on. I took my carry on bag and put my feet on it... again, ample room here. If/when I re-fly AerLingus, I'm paying extra for these seats... guaranteed... Best seats on the plane. These were great seats as they had a tremendous amount of leg room. Both a slightly narrower than the standard seat but they were not so uncomfortable that you couldn't enjoy them. The seat by the door really required that, unless your feet are up against the back of the seat, that you put your legs on the door as it is RIGHT in front of the door. Regardless, it was a very comfortable experience. I enjoyed seating in 11 A & C on the return trip better as there was much more leg room... That you cannot have your bag in front of you for takeoff and landing is immaterial as they are more than willing to assist you in picking up and returning your bag to you immediately after take off... not an issue. I flew this flight with my family on 5 June 2016. I want to note that 15K, which is a choice seat, has a misaligned window. Also, the worst part of this flight is that the seat rest does not go up all of the way. 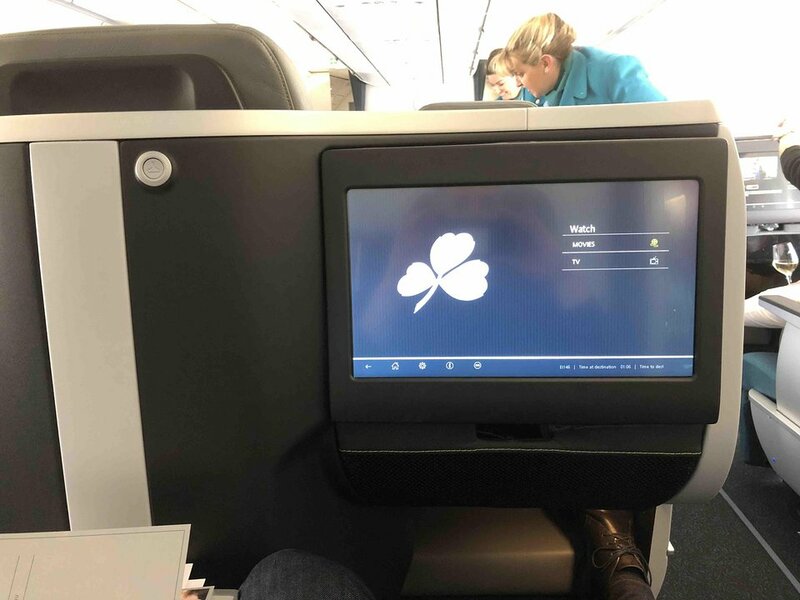 So, if you want to stretch out, Aer Lingus has now made that impodsible. This is a belated remark for 30 September 2015. 12A has very little legroom, no window and 11A when reclined, sits in the middle of your face. I had to ask the drunk person in front of me not to recline as it was not possible for me to turn or get out of my chair if he did. There was nowhere, not here either, that there was no window on row 12! Had I known, I would not have paid the extra 50 quid! Seats were 18inch, not 17inch. 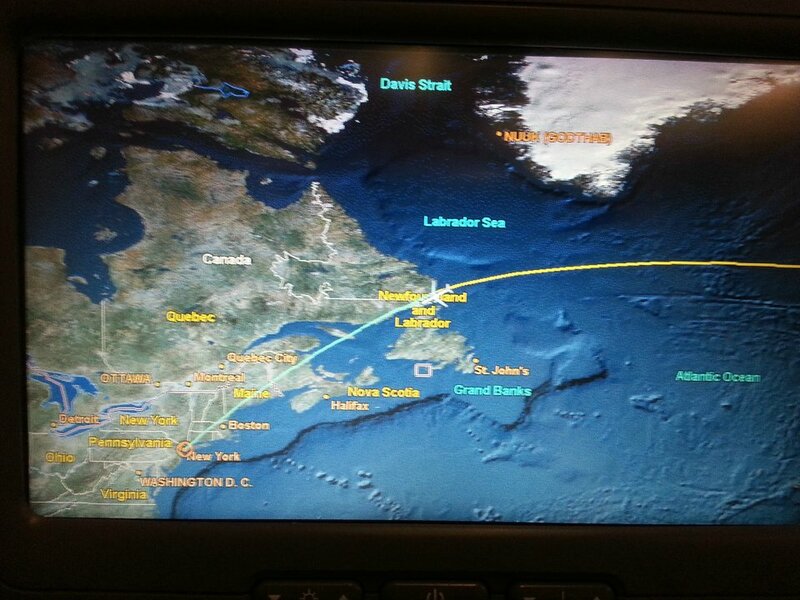 As far as the flight goes: all was just fine. Good food, seat was good for a built man of 1.8M and I was able to sleep for about 3 hours on an 8 hour flight. Overall this experienced flyer had a good experience, and will take this seat over a cramped QR788 seat. Very limited leg room do to door bump-out. Extremely noisy due to galley. Uncomfortable and not worth the extra money to upgrade for bulkhead. Very uncomfortable, and extremely narrow seat. Not suitable for adults. Lots of galley noise for the entire flight makes resting/sleeping impossible. Do not recommend - save your money. I thought this seat with the misaligned window was okay .. .. The window was just off my right shoulder and it wasn't too much effort to get a good look out, or take a picture .. .. The legroom was fine, IF entertainment was fine, as was the flight in general .. .. THANKS AER LINGUS! Very flimsy seats, very narrow seats. Touchscreen monitor requires heavy pressing, causing seat to move. Worst seats on any plane I've been on. Aer Lingus did manage to get vegan meal on board, though. The arm rests do not fully retract--only go up about 2/3 of the way, so you can not lie down flat on the center 4 seats, for example. Very disappointing. Aer Lingus flies 2 versions of Airbus A330-200 (332) Layout 1.